Presence indication gives users the ability to quickly see who is available to chat, talk or videoconference, using a screen based client which is available on PCs, tablets and mobiles. 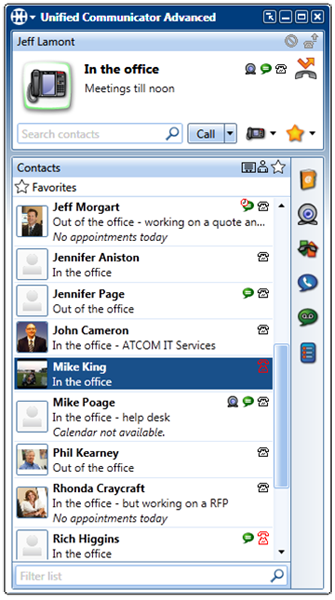 It displays the ability and willingness of colleagues to communicate, usually with icons and text showing the user’s status such as “free”, “busy”, “away”, “do not disturb” and “out to lunch”. Having the ability to see who is available can avoid wasted calls and voicemail tag when trying to speak to a colleague. Being able to chat onscreen, even whilst on a call can mean getting the answer you need quickly and resolving customer issues more effectively. Here at Cavendish we offer a range of communication solutions that provide presence indication, including our Horizon Hosted Telephony Service, Skype for Business and solutions from Mitel and Panasonic. Talk to one of our experienced consultants to find out how your organisation can benefit from presence and availability solutions and which solution would best suit your needs. To find out more about our Voice Messaging Solutions call 0800 206 2107 or send us an email.